As I write this, on a Fall Day in 2018, Shannon Shanning, 2013’s Maine Teacher of the Year, is creating a chapter by chapter Curriculum Guide for Mystery of the Bear Cub based on having taught it with our students. Down below are some of our favorite, and student’s favorite, activities from that time. For great classroom lessons and projects, follow Shannon on Twitter @sshanning28 or follow me, @TamraWight, since I’m in the classroom as well. Everyday, we post interesting, interactive and current concepts, as well as student reactions to the lesson plans. 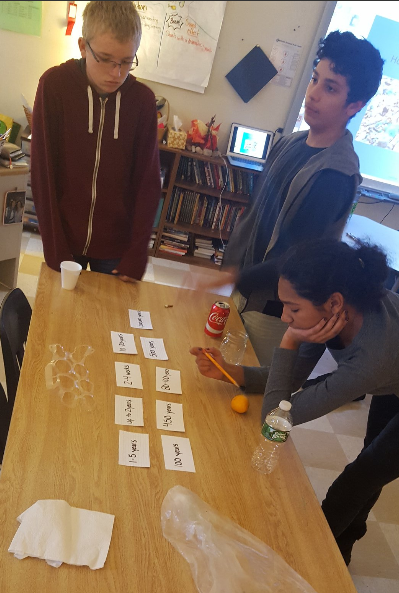 Have students try to match them while discussing topics such as why it takes glass a million years, as opposed to a tin can that takes 50 years to completely decompose. 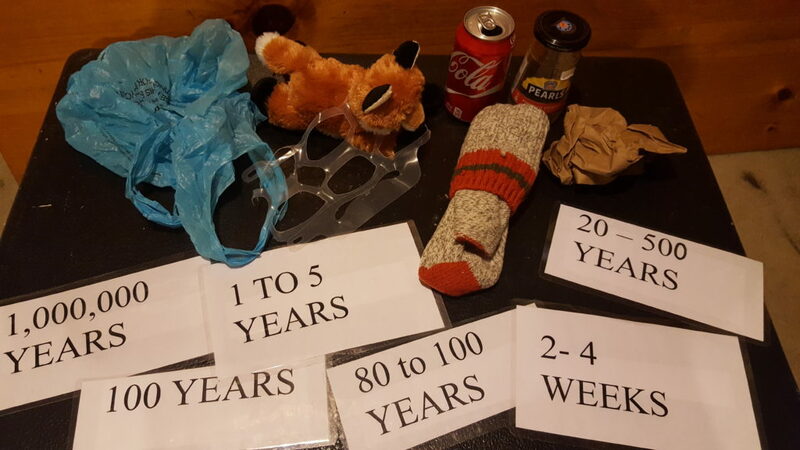 Why are six pack rings and fishing line a danger to animals if left in the wild? Leave No Trace A great resource for teaching the effects of litter on our planet. This link has the decomposition timeline and a video you can show students. It also has some alternate teaching resources. Ocean Garbage Patches The National Ocean Service Podcast on Garbage Patches in our oceans and how they were created. Black Bears were the one animal of the series I couldn’t monitor first-hand or take pictures of in the wild. We simply didn’t have them at Poland Spring Campground when I lived there. Besides, black bears normally try to avoid humans at all costs. So, I visited the Maine Wildlife Park in Gray, Maine several times to ask questions and get a closer look at the animal I wanted Cooper and Packrat to help save. I talk more about this in my Acknowledgements in the back of the book. Then, a year after Mystery of the Bear Cub was released, and we had sold our 40 acre campground to move to a 2 acre piece of land, this black bear visited my backyard! Imagine my surprise! I’m posting the video here, for you to show your students as a pre-reading activity. You just never know the wildlife that might come visit you! Chapter 1 features a Snapping Turtle fight, which I really did witness from my kayak along with fellow kayaker Cynthia Lord. We must have watched the two turtles fighting for at least 15 minutes! Taking photos and videos is how I collect most of my research, and I use them to pull the describing details I’ll need to put the images in the readers head, so they’ll see the same turtle fight I did. Show these videos to your students. Then read chapter 1. Afterward, ask students which details they think pulled directly from the video. For example one answer might be: A huge claw-like thing, about the size of my palm, rose up out of the water. It was dark brownish-green with nails about an inch and a half long. Sharp nails! It hung there, reaching for the sky. 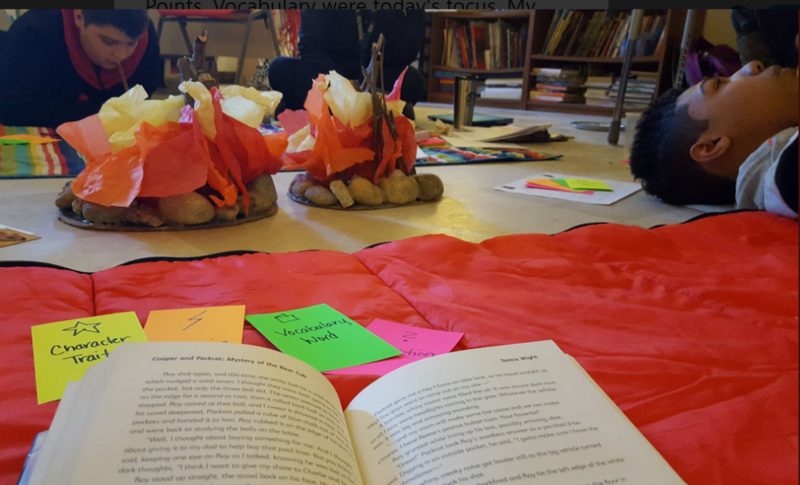 What better way to read, discuss, and analyze Cooper & Packrat’s adventures than by sitting around a campfire? 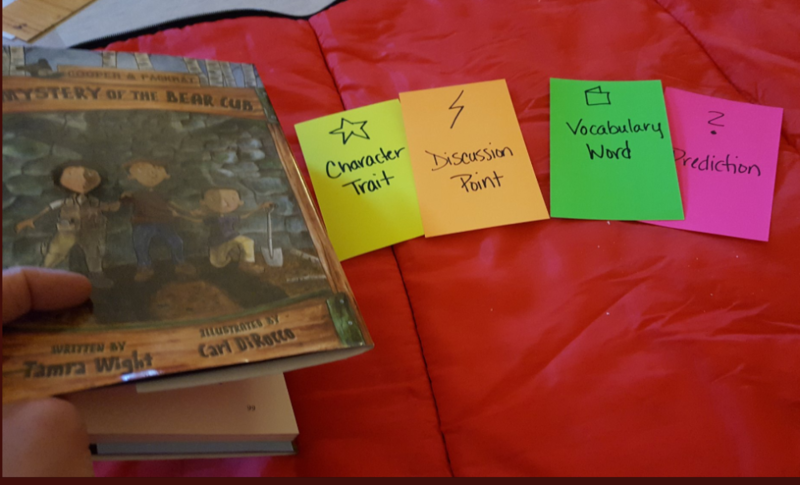 Create Prediction, Character Trait, Discussion Point, and Vocabulary cards for each reader and yourself. As students read out loud over the campfire, anyone may ask a question or suggest a prediction by holding up the appropriate card. Campfires are easy to build! The base is a circle of cardboard, with a ring of rocks hot-glued around the outer edge and a teepee of sticks inside the rocks. When the glue is cool, put flickering battery operated tea lights in the bottom and tuck red, yellow and orange tissue paper inside the sticks. Shannon and I like to serve hot cocoa and a snack, and turn the lights down low so we can see the flickering campfire. We’ve also played campfire sounds. Students beg to read! What is a Privy and What Can You Find In It’s Depths? 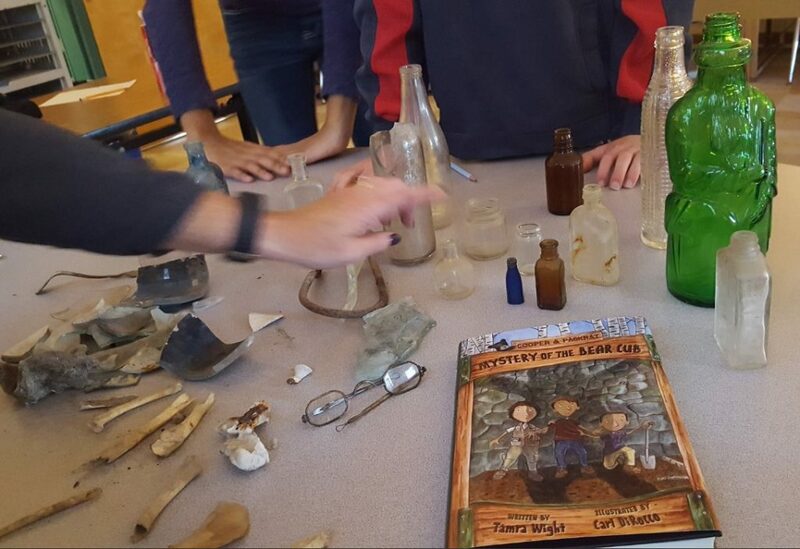 We were fortunate enough to have Shannon’s findings from in and around her 100 year old farmhouse to use as a hands-on activity to show students what could be found in a privy dig. When students think of a privy, they think of a porta-potty. But privy digging is more like an archeological dig. 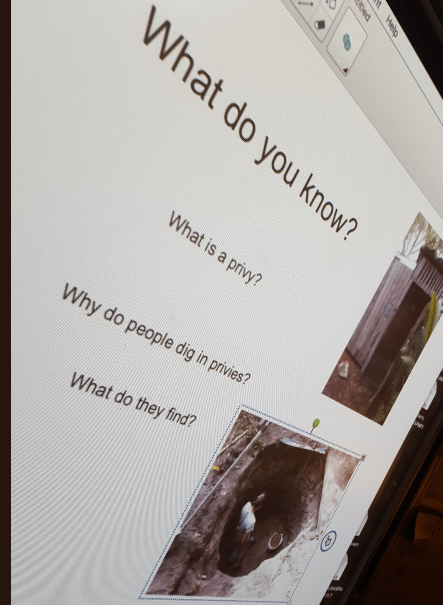 Here are some links about privy digging to help give you and your students background knowledge. Some incredible things have been found through privy digging! Treasure Hunters Privy ~ USA Today – The article we used to talk to students about privy digging and 150 year old poop. Bottle Dumps: Where Did They Come From? While hiking in Auburn, Maine one day, my husband and I saw something glinting just a couple yards off the trail through the woods. I followed that glint, until I found a bottle half buried under leaves and dirt. 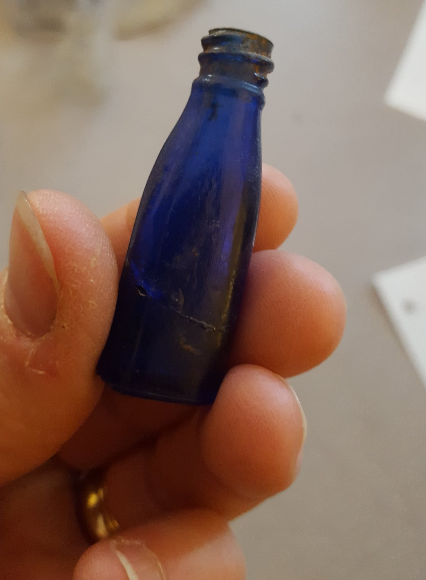 I dug out that bottle and found another and another. Back at home I looked on the internet and discovered a whole new world. Bottle dump research led to Privy digging which had me giggling over 100 year old poop being dug and sifted for historical artifacts. Right away I envisioned the scene where Cooper and Packrat eat their lunch at the bottom of a privy dig site. The rest of the story grew from there.